Supporting your child's student finance: Q&A - Which? Note, the below refers to students in England beginning a full-time degree course in the 2019/20 academic year (unless otherwise stated). As a parent, you probably have a lot of questions about your child’s student finance, including about how much you should be contributing yourself, and how your child can get a higher amount of Maintenance Loan to cover them. 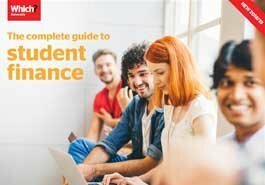 Firstly, make sure you know the basics – grab our free student finance guide covering everything you need to know, from loans and extra funding to budgeting and repayments. Do I have to give proof of my household income? What information or documents do I need to provide for my child's application? I'm a divorced parent. How does this affect my child's finance application? I/my partner receives disability benefits. Will this affect my child's finance application? If our financial circumstances change while my child is at uni, will this affect what they receive? If my child doesn't receive enough in loans to support themselves at university, what are our options? If my child leaves their course early or changes to another university, what happens to their student loans? Should I help my child repay their student loans earlier? Does my child's student loan affect their credit rating? No, you don't have to. The Tuition Fee Loan is non-income-assessed. Your child can also get some Maintenance Loan if you choose not to provide your household income, but it might not be the maximum amount available to them. So it can pay off to provide this information. Generally speaking (especially if your children live with you), you’ll need to provide certain information if your child is applying for student finance. There are circumstances where you might not have to such as if your child is over 25, or married or in a civil partnership. In these circumstances they might be considered an ‘independent student’. However, you’ll usually have to provide details of your household income, and the number of dependent children you have. A dependent child is defined as someone aged under 16 or someone aged between 16-19 in non-advanced education. Being a uni student doesn’t count as non-advanced education, so if your child has a brother or sister at uni, they’re not going to count as one of your dependants. If you need to provide proof of earnings (remember, you don’t have to, but you’ll need to for your child to get more than the basic level of student loan), this could be your P60 or Self-Assessment tax return, and your National Insurance number. You will also have to give evidence of any taxable state benefits, pensions or any income from UK and foreign investments. Your child will need to apply for student finance every year. But they’ll be defined as a ‘continuing student’, so it’ll be less involved than the first year they apply. What parents need to know about their child's student finance. If your child does apply for income-assessed support, they will be asked to give the financial details of the parent that they 'normally live with'. If that parent is married, in a civil partnership, or living with a partner, that partner will also need to provide their details. The other parent (the one your child doesn’t usually live with) shouldn't need to give any details. Any tax-free state benefits, such as Disability Living Allowance, are not counted as household income, so this shouldn't affect what your child receives. Your child's entitlement is based on household income for the previous tax year. So, an application for finance for September 2019 will look at your income for the tax year 2017/18, and so forth. However, if your household income is at least 15% less than it was in the previous tax year, you can apply for a Current Year Income Assessment. This will review your expected income for the present tax year. Student banking tips: choosing an account, overdrafts and more. How much am I expected to pay? What if the loans don’t cover enough for my child to support themselves? With accommodation, course and living costs to manage, your son or daughter might well find that their Maintenance Loan alone won't be enough to cover these. It might be down to you to help make up the shortfall, particularly given that the level of support your child receives will be based on your income. The Scholarship Hub found that over half of parents subsidised their child at university by over £200 per month (1/5 gave more than £400 per month). Meanwhile, almost 2/3 of parents admitted to cutting back on other spending to do this. To help you start planning ahead, use our student budget calculator to see roughly how much your child will need to live on at their chosen university. It's definitely worth exploring what extra funding is on offer at your child's university, as this varies from uni to uni. Six in 10 students we surveyed didn't apply for a bursary or scholarship at all, citing reasons like not thinking they would eligible (73%), not knowing where to go for information (15%), or finding out about them too late (11%). Read our guide to which bursaries and scholarships are available, plus pick up tips from students who (successfully) applied for these. How a part-time job now can pay off later. If my child leaves their course early or changes to another university, what happens to their student finance entitlement? Any changes to course, mode of study (eg from full-time to part-time), university or any repeat years will affect your child's funding allowance, including what they're eligible for if they drop out and apply to university again in the future. It's vital they seek proper advice from a student finance adviser at their uni, or their student finance agency, before making any major decisions or changes, and to get this advice in writing. If your child changes university or course, the amount of funding they receive could change depending on whether or not they study in London, and the number of weeks the course runs for. If they leave one university and start at another, they could also be put on to a new support package if the package has changed. Should I help my child repay their loans earlier? Loans gain interest from the day they are issued until the day they are paid or written off. If you have the funds available and wish to cut down the interest the loans are accruing, it’s possible for you to make a contribution. However, it's worth considering a few points first. The interest rate on the student loan is comparatively very low compared to other debts; this changes in line with inflation. For students still studying, this will be RPI + 3%, but it varies once you graduate and depending on how much you're earning. So you or your child could be better off putting excess money in a high-interest bank account. If they have any other debts, it’s far better to put the money towards that instead. Also, students only begin repaying their student loan once they're earning above a certain salary threshold (and only then will they pay a small percentage of the difference between this and their actual annual salary). This threshold varies from country to country. Check one of our regional finance guides below for more information about repayments, or our guide on how much you'll pay before it's written off. You also need to be aware of early repayment fees as well. Make sure you look into this before putting a wodge of money into student loan debt. Remember that for students beginning university now, student loans are written off 25-35 years after the first April following graduation (depending on where you're from). While difficult to predict, if you pay off more of their debt sooner, you may end up paying more back than you actually need to. Learn more about student loan repayments in our student finance guides for England, Scotland, Northern Ireland and Wales. Your child's student loan will not affect their credit rating, and won't show up on a credit report either. When your child applies for a mortgage, their loan repayments may be taken into consideration in terms of calculating their net income. Julie Kelly is the Head of the Student Centre at the University of Hertfordshire. The Student Centre is a one-stop shop for students and applicants providing advice and information regarding a wide range of issues, including student finance. As a mother of two teenagers, she's also seeing university life through the eyes of a parent first-hand. *Data source: Which? University Student Survey 2018, surveying 5,000 undergraduate students at UK universities between March and April 2018. Our parents' guide contains everything they need to support a child applying to university. An essential for parents' evenings - download and print copies here.